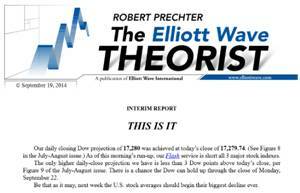 On September 19, the much maligned Robert Prechter declared to his subscribers (of which I am one), “THIS IS IT!” By that he meant, this is THE TOP IN THE STOCK MARKET FOR OUR LIFETIME! 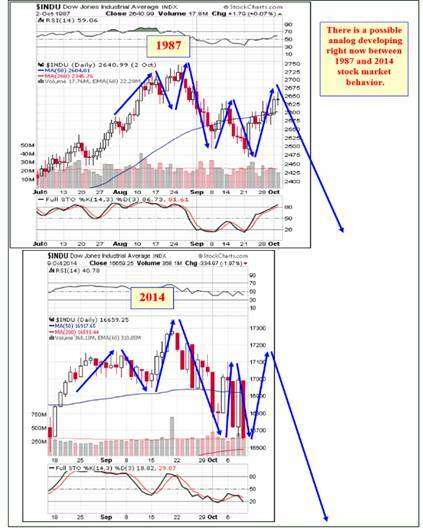 Now given the turn in the market this week, Prechter’s call of a top on September 19 appears exceptionally prescient. I sent an email to my good friend Ian Gordon this past week to ask him if he thinks we have now seen a generational peak in U.S. stocks, and he was certain that was the case. By the way, Ian appeared on my Oct. 20, 2009, radio show along with Robert Prechter. Prechter who predicted a sub 1000 DOW and lower gold prices, and Gordon predicted a 1000 DOW and a $4,000 price of gold. You can listen to my interview with both Prechter and Gordon here: http://ow.ly/CAENK. Although Prechter has been steadfastly (and wrongly) bearish about gold since then, I think he is much more reasonable about gold than most gold bugs think. Prechter believes gold will rise in value vis-à-vis nearly everything other than the dollar. He is indeed an extreme deflationist. The difference between Prechter and Gordon is that Prechter believes the dollar will prevail while Gordon believes it will suffer the same fate as all other fiat currencies in history have up until this time. Can there be any doubt that if central banks everywhere stopped printing massive amounts of money, we would enter a deflationary depression that would cause the 1930s Great Depression to seem like a beautiful Sunday afternoon walk in the park by comparison? Of course, given the massive debt built up over many decades, the Fed is quite rightly fighting deflation tooth and nail, and from their perspective they are right to do so. I completely understand their short-term fear. But of course the Fed never should have been born and we never should have left honest money in the form of gold and/or silver. But that requires a separate discussion. A look at my Inflation/Deflation Watch (IDW) chart shown below illustrates that following the Lehman Brothers default, in 2008-09, we had a brief period of massive financial market deflation as prices in all the items in IDW collapsed in value in a very short period of time. The only question is whether the Fed will have the ability to stop the plunging knife the next time when the dominoes begin to fall. By the way, let me say I have no argument with the Austrians, who define inflation as an expansion of the money supply and deflation as a contraction of the money supply. I am simply defining deflation as plunging prices vis-à-vis the accepted currency. What I am saying is that not only in the 1930s when we did have a gold standard, can you have plunging prices. We saw that happen in 2008-09 when there was no gold backing the dollar. Now the question as I write this letter on Friday evening is whether we are on the precipice of the next major plunge in prices. Not only Prechter and Gordon think that is the case but so does Dr. Robert McHugh. Here are some of Dr. McHugh’s latest remarks after the markets closed on Thursday. “After a powerful up day Wednesday, October 8th, when most pundits on our favorite financial cheerleader cable TV station declared the end of the latest mild stock market dip, stocks got crushed Thursday, October 9th, having their worst day of the year in 2014. The Wave labeling and price pattern since September 19th, 2014, differed with conventional Fed worshipping wisdom, showing a market in a well defined downtrend channel with tops stopping at the upper boundary of this channel. History showed that when we see frequent dramatic reversals almost daily, that the stock market is in a very dangerous place, unhealthy, and at risk of crashing. “The Plunge Protection Team or its surrogates are buying the stock market hard right now on every sharp selloff. That tells us bids are scarce, and without the buying, a collapse is likely. The sharp bounces are mostly driven by panicked shorts covering open positions, in other words, those most pessimistic about the markets are doing a huge chunk of buying on up days, driving corrective rallies higher. This makes the point we made over the weekend that bear markets like to shake out the short positions before they collapse markets so that only a few make money on the decline, so that most shorts are either out of the market or light on short positions with bulls exposed for a slaughter. “On Thursday, Demand Power fell 8 points, while Supply Pressure rose a huge 17 points telling us that folks were dumping stocks, panic selling was occurring, and that deep pockets stepped into the unbalanced orders, made the market, and kept a collapse from occurring. The damage was bad enough in spite of the deep pockets intervention. Is the bottom near? Not at these levels. Maybe for a short bounce, but probably not yet at these levels. We say that tonight because none of the key indicators we watch suggest that selling capitulation has occurred and a significant bottom has arrived. Oversold New Lows, an oversold 10-day average Advance/Decline Line Indicator, necessary Bullish Divergences, and other measures are not present at this time. Therefore, patterns aside, more downside is likely. “Thursday’s decline was powerful and it was more than enough to generate new Sell signals in our short-term key trend-finder indicators for both Blue Chips and Techs. Our intermediate term Secondary Trend Indicator also remains on a Sell tonight. Batten down the hatches. “The stock market remains on a confirmed and official Hindenburg Omen from Friday, September 19th. This comes at the precise same time that a rare and important and dangerous Bearish divergence is occurring between the NYSE cumulative Advance/Decline Line and stocks, and also is coming at the same time the long developing multi-decade extremely dangerous Bearish Jaws of Death pattern looks complete. It also comes when the Fed will now be pulling liquidity out of the market. This confluence is very dangerous, and it is arriving at the seasonally worst time of the year for stocks, the September into October timeframe. “Gold: The HUI Advance/Decline Line Indicator is starting to show a small Bullish Divergence, so while more downside is possible in Gold and Mining Stocks, a bottom is in sight. There are several short-term possible paths for Gold at this time. With Gold’s Daily Full Stochastics now deep oversold, it is possible Gold is putting in the bottom for wave b-down of d-up. If so, it means c-up of d-up will soon begin, taking Gold toward the upper boundary of the declining trend-line, toward 1,350ish. The above missive was sent out to McHugh’s subscribers at 1:05 New York time on Friday morning. (Bold italics are my emphasis and not from Dr. McHugh.) While Robert suggested there could be a brief respite on Friday, that simply did not happen. Here were the results for the major indexes on Friday Oct. 10. Dr. McHugh works extremely hard for his subscribers. I have had him on my radio show as well at various times in the past and expect to interview him sometime this week (this audio interview will be posted once it is done at my website jaytaylormedia.com). I recommend highly that if you are an active trader you subscribe to his service. Go to https://www.technicalindicatorindex.com to do so.